Home Food Thought Tandoori Food Wasn’t Healthy? Try These Dishes! 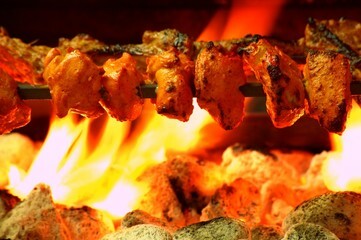 Tandoori food is synonymous to deliciousness. The smoky and well-spiced dishes just make our mouths water. Everyone has their favorite tandoori dish, some like tandoori paneer, the non vegetarians drool over tandoori chicken, the seafood lovers are crazy about tandoori prawns. But what about the health conscious? Can tandoori food be healthy? Why not? Lets check out some healthy and super delicious tandoori kebabs! No more tandoori gobi, now’s the time for tandoori kale! Kale is a variation of cabbage. It is one of the most healthy and nutritious plant foods. Not only is it nutrient-dense, it is also high on antioxidants. It is high on Vitamin C and K, minerals,low on cholesterol, fights cancer and reduces the risk of heart disease. Using kale in a tandoori dish would add all these lovely benefits to your daily routine. Tandoori kale is really easy to make. You can either just sauté the kale with some tandoori masala, garam masala, curry powder, chopped scallions and nutmeg. You can also add some Greek yogurt. Or else, you can marinate the kale in these spices overnight and then sauté them, that will help the flavor develop better. Soya Tandoori: A Protein Powerhouse! The vegetarian protein rich tandoori kebab! Soya is one of the best sources of vegetarian protein. It is very healthy and a source of high protein, B vitamins and minerals. Soya tandoori is a great addition to the tandoori kebab list, and a treat for vegetarians. After soaking soya in warm water for an hour, squeeze out the water and marinate them. The masalas in the marinade can be your choice. Garam masala, tandoori masala, nutmeg, cinnamon, ginger garlic paste, kasoori methi and curd, you can add anything you want. Then you can just cook the soya on a pan with some oil or ghee. Tandoori soya is ahealthy and delicious treat for your family! Some other other healthy options include tandoori mushroom, tandoori broccoli or even tandoori paneer and chicken (with less butter and fat while cooking). You can experiment with these simple, healthy but irresistible tandoori dishes, which are guilt-free and super yum! So, when is your kitchen turning tandoori healthy? ?